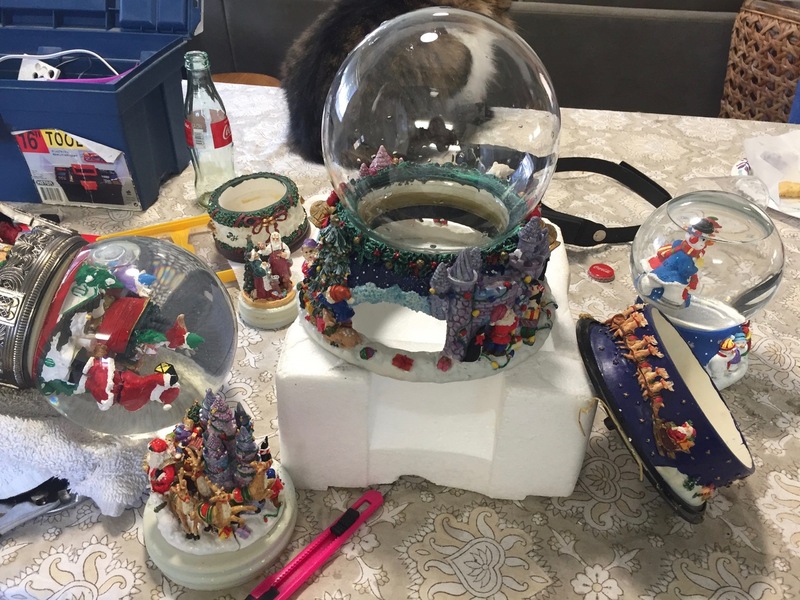 It’s Monday April 8, 2019: At the end of the third day of putting away Christmas decorations this year, I got a hernia, so I still have decorations up such as all the houses, some trees, and the front display. I should be recovered in a few more weeks and will finish putting everything away. In the mean time I’ve been working on other projects such as refurbishing my snow globes. It was unfortunate last year that on 2 of our usually most attended nights, Christmas Eve & New Year’s Eve, we were rained out. We had a little window of no rain each night, but it did rain. For 2019, we have big plans hopefully. One is that I have a contractor who is going to try and put up a temporary partition in our house, so we can let people come in and see our miniature village display. We tried it in the past and that didn’t work out to well for us. There will also be major changes in our Toyland and we will be selling Farley’s Christmas Wonderland tee’s, sweatshirts, and coffee mugs to help pay to keep our display going, so I don’t have to keep selling my surfboards. One thing that we do loose every year and that is Christmas tree’s. They’re outside for so long that they take a beating and because of my being temporarily disabled this winter they were out for longer than usual – some still are. 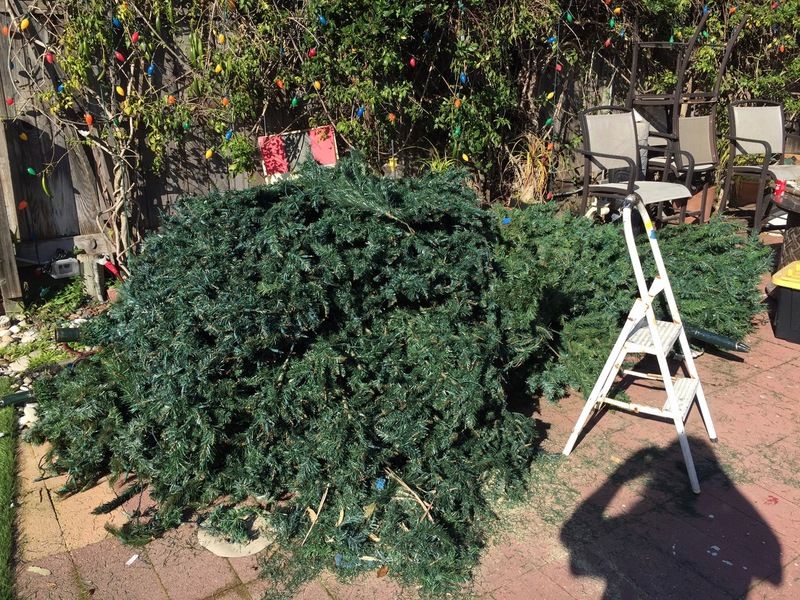 Every year at the end of ChrIstmas, I spend a lot of time looking for 12′ plus artificial Christmas tree’s and every year it’s getting harder. There’s not a lot of companies anymore and the stores only carry what they think they can sell. It used to be that everyone would have a lot of surplus and then discount it. Now, everyone is sold out before Xmas. I think everyone went into the Halloween business, they have so many neat things’ especially in the animatronics and they’re affordable. 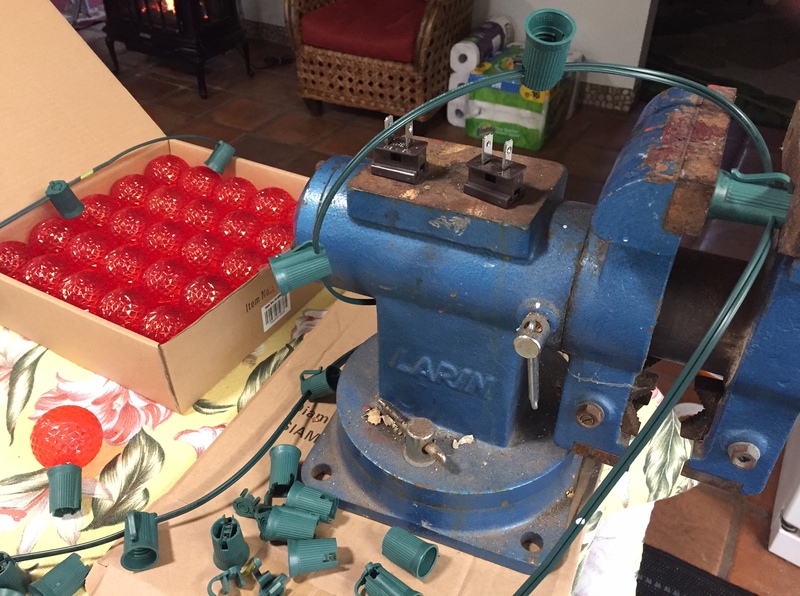 This past year I started making our own Christmas lights; it’s costly. But, when a light goes out it’s just that light and it does not effect the others. I just threw away a set of C9’s yesterday that claimed if one light goes out it that it will not effect the others – so why did half the light strand go out? I spent over a few hours trying to find the bad light and never found it and had to throw it away. I will be adding more lights to the fairy garden and our ferns that I planted last year are now growing and looking good. I had to redo a lot of the solar lighting – I converted them over to ac so they now have plugs. I’ve bought so many solar lights and they just do not last – they look good, but they’re to expensive not to last.